When I was invited to Steph's place for a CNYE potluck I immediately panicked because I don't really make much in the way of Chinese food. I decided that for my dessert I would make mango pudding. My best friend's sister owns a Chinese restaurant & when I used to go there when I was omni she would always give me delicious mango pudding so I got her recipe & gave it a go. The first time I made it I used gelatine free mango jelly in it & it was absolutely disgusting. So I gave it another go using agar agar & while it was better it still wasn't super tasty. Then I threw a bit of a tantrum (because none of my savoury food was working either) & decided that I would just make a cake. 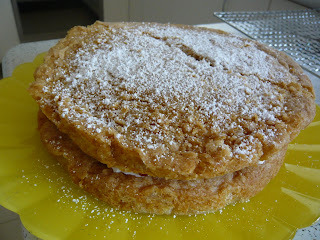 In a nod to CNY, I decided to include lychees so I made a sponge filled with lychees, strawberries & soyatoo. I wanted all my food to be gluten free so everyone could eat it & found a recipe from a blog called Cooking with Dia which looked really easy & didn't have 4 different types of gluten free flour. 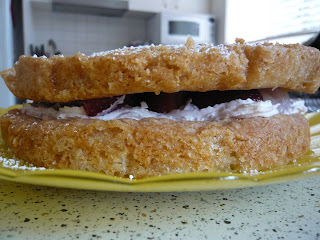 This recipe is super easy & turned out really well - my only problem was that it didn't make nearly enough to make 2 cakes & I actually had to make a second cake for the other layer. Cream the vegan spread, extract and caster sugar together. Slowly add in the egg replacers and mix in with the vegan spread and sugar. Meanwhile sift the flour twice and slowly fold into the mixture. Stir together until nice and creamy. Split the batter evenly between to 6″ sandwich tins. Bake at 180°C (356°F) for 20 minutes. Turn out on cooling rack. I actually broke the top layer when I was taking it out of the tin which is why there is a massive crack in the top of the cake - oops! Your other food was yummy too! Thanks :) I had so many disasters trying to make both dishes! Is it wrong of me to say that I'm glad that your first dessert didn't work because then you could introduce me to one of the greatest sponges cakes ever! It was bloody great! And I've already promised to make it for my coeliac MIL so we can both enjoy it. Snaps to you! Yummy looking cake and it was so good of you (and everyone else) to make gf food! it was a really good cake, and it was super meeting you!